Salt Lake City Scandinavian Music and Dance (formerly known as Salt Lake Scandi Dance) is a recreational dance group that meets twice a month. 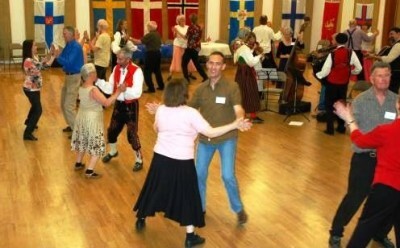 Nordic dances from Denmark, Finland, Norway, and Sweden are danced. No prior dance experience is necessary in order for you to enjoy yourself. There are usually 2-4 dance instructors present at each evening's dance. We dance a mixture of Gammaldans, Bygdedans, and Set Dances and Mixers. In the mixers, everyone exchanges partners multiple times during each dance. 2nd Saturday Scandinavian Folk Dance - Live Music!